Konya is a city in west-central Anatolia with lots of history and beautiful Asian architecture. The area was settled around 3000 BC, and the city is best known for its Seljuk era glory and its connection to Mevlâna Rumi, the founder of a Sufi school and one of the world's great mystic philosophers. At the center of Konya there's a park built over a small hill surrounded by a traffic circle. That's Alaettin Tepesi, Turkish for "Ala'adin's Hill". It's a Bronze-age tell, or mound. There was a settlement here long ago! The area was settled around 3000 BC, during the Late Copper Age. 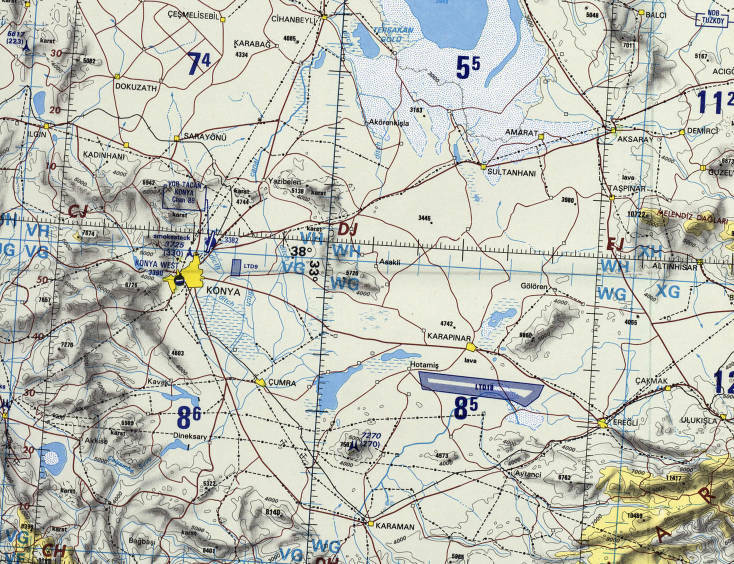 Çatal Hüyük is close to Konya. It's the site of the earliest known community in the world. This area has been populated for a very long time. The Hittites became the predominant power in the region around 1500 BC. They were replaced by the Sea Peoples around 1200 BC, who in turn were replaced with the establishment of the Phrygian kingdom in the late 8th century BC. Xenophon described the settlement as the last Phrygian city. It then was known in Greek as Ίκόνιον or Ikónion, referencing an ancient legend about the eikon or image of the Gorgon's head. Cimmerian invaders overran the area around 690 BC. The region became part of the Persian Empire until Alexander the Great defeated the forces of Darius III in 333 BC. It was then ruled by Greek successors to Alexander, and then was transferred to Roman control. They called it Iconium, from the earlier Greek name. It became a major inland city under the Romans, when it was already an extremely old settlement. Saints Paul and Barnabas visited Iconium around 47-48 AD (see Acts 14:1-5 and 14:21), and Paul and Silas probably visited again around 50 AD (see Acts 16:2). It was destroyed several times by Arab invaders during Byzantine rule in the 7th, 8th, and 9th centuries. The later Arabs, Persians, and Seljuk Turks called the city Rum, as in "Rome", after the previous civilization that had built much of what they found. The city was then ruled by a series of Anatolian Seljuk sultans. Rukn al-Dīn Mas'ūd changed the city's name to Konya, which the recent Turks have continued. It became a provincial capital of the Ottoman Empire in 1453. Konya is well-connected by bus, with its otogar or bus station on the edge of the city. It is just about three hours between Konya and any of Ankara, Göreme, Adana (and Olimpos), and only four or five to Denizli (and Pamukkale). If you buy your bus ticket at an office in the city, they may be able to give you a ride to the otogar in a servis, or minivan shuttle. However, that locks you into a limited choice of bus companies, and thus schedules. It's better to take the tram from Alaettin Tepesi to the otogar and buy your tickets from the wide array of bus companies. There are two overnight trains traveling İstanbul — Eskişehir — Afyon — Konya. Meram Ekspresi leaves İstanbul 1920, arrives Konya 0821. Içandolu Ekspresi leaves İstanbul 2350, arrives Konya 1215. Meram Ekspresi leaves Konya 1750, arrives İstanbul 0630. Içandolu Ekspresi leaves Konya 2058, arrives İstanbul 0909. The Otel Derviş seems like a good place to stay. It has nice rooms, low prices, and is on the edge of the bazaar just a few blocks from the Mevlâna Shrine. What's it like to visit Konya? 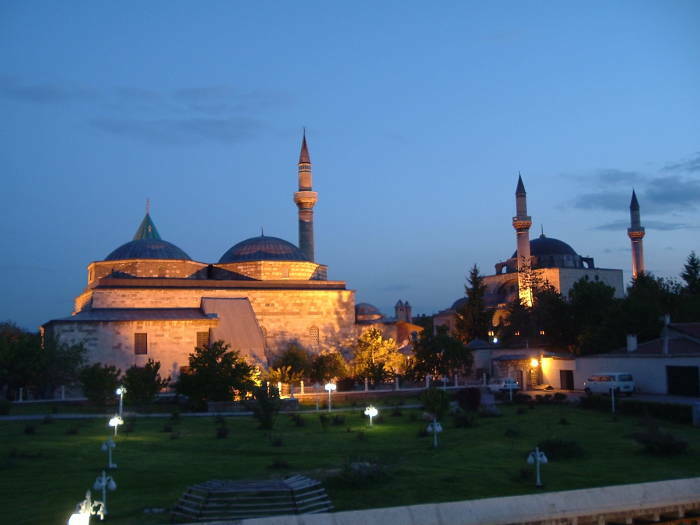 Is Konya an "overly religious" place to visit? Not at all! As a non-Turk you will be in a tiny minority there, but that's it. And you will still be in Turkey, which means that you will be made to feel extremely welcome as an honored guest. The main attraction in Konya is the shrine and tomb of a holy man, yes. But it's Mevlâna Rumi, the founder of a Sufi school of thought that is very open and welcoming — see below. Celaleddin Rumi, or "Celaleddin from Rum", became known as Rumi or Mevlâna. He was one of the world's great mystic philosophers. Rumi founded the Mevlevi Derviş order of Sufiism, known in the west as the Whirling Dervishes. He lived in Rum, now Konya, where he wrote the Persian poetry that is still a popular seller. His tomb is in the Mevlâna Shrine, where other Sufi mystics are buried. The blue-green tiles and Seljuk architecture give it a more Central Asian atmosphere than much of what you find elsewhere in Turkey. 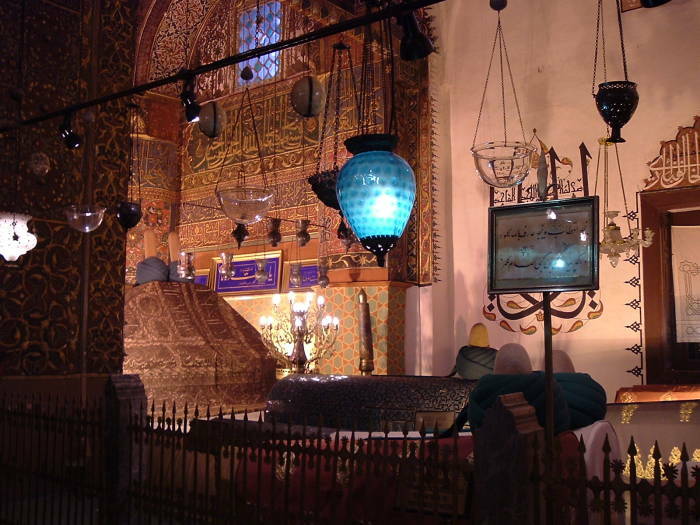 The tomb is known as the Yeşil Türbe or the Green Tomb. His epitath reads: "When we are dead, seek not our tomb in the earth, but find it in the hearts of men." Rumi was born in 1207 in the northeastern Persian province of Balkh, in today's Tajikistan, near Afghanistan. Hs family fled the Mongol invasion by moving to Mecca, then to the Sultanate of Rum, based in Konya, arriving there in 1228. His father, Baha'uddin, was a noted preacher. 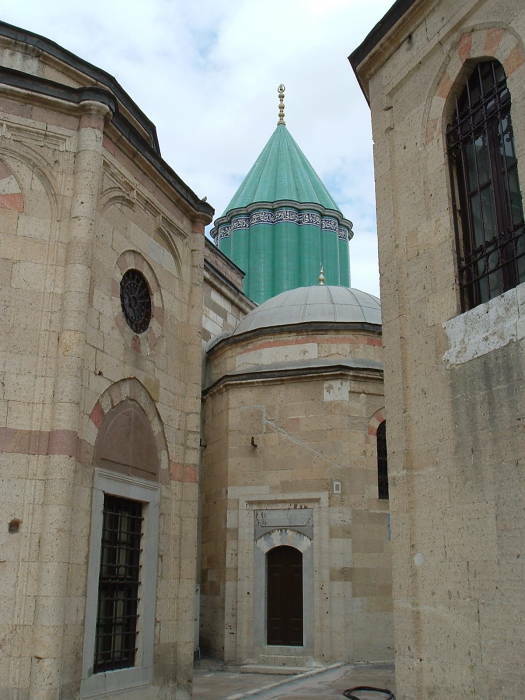 After his father's death in 1231 Rumi studied in Aleppo and Damascus and returned to Konya by 1240. In 1244 he met Mehmet Şemseddin Tehrizi, called Şemsi Tebrizi, one of this father's Sufi disciples. Tebrizi had a profound influence on Rumi. Rumi's followers were jealous, and killed Tebrizi in 1247. Stunned by the loss, Rumi withdrew from the world to meditate and wrote his great poetic work, the Mathnawi (or Mesnevi in Turkish). Whoever you may be, come. Our brotherhood is not one of despair. He advocated a doctrine of unlimited tolerance, positive reasoning, goodness, charity, and awareness through love. To him and to his followers, all religions are more or less truth. Rumi felt that religion was mostly a personal experience, not limited to perceptions of the senses or logical arguments. He became known as Mevlâna, meaning "Our Guide". After his death on 17 December 1273, his son Sultan Veled organized his followers into the Mevlevi Derviş, or Whirling Dervish Sufi order. Rumi taught his followers to use music to focus their entire being on the divine, doing this so intensely that the soul was destroyed and resurrected. He encouraged samā, turning in a sacred dance while listening to music. When Atatürk founded the modern nation of Turkey, he disbanded the many religious orders including the Whirling Dervishes. This was out of concern that they would try to influence politics. The constitution of Turkey requires a strict separation of religion and government. Most Turkish political leaders are devout believers, but they have to be very careful to keep that separate from their government work. A 1925 law dissolved the Sufi Orders, banned their use of mystical names and titles and costumes, impounded the Sufi Orders' assets, and prohibited their ceremonies and meetings. In the 1950s, the government began to allow one annual celebration in Konya, two weeks centered on the anniversary of Rumi's death. 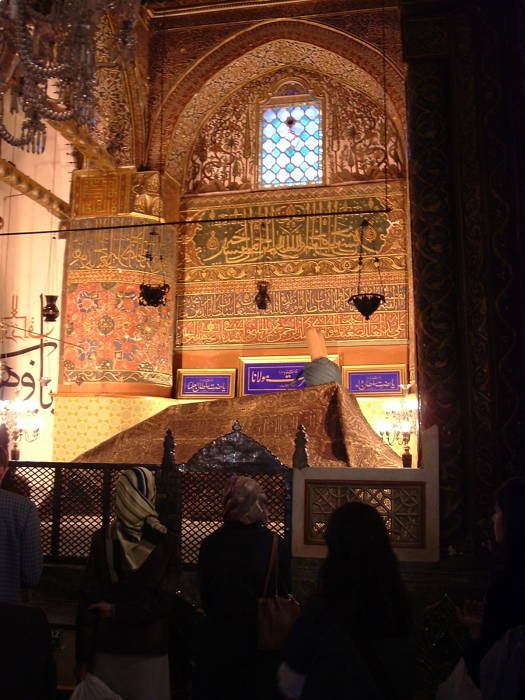 This is Rumi's tomb inside the shrine. Rumi and the shrine were on the reverse of the 5000 TL note used from 1981 through 1994. By the early 1990s the inflation of the Lira would have dropped the value of this note to about US$ 0.20. Konya gets a lot of visitors, and most of them are Turkish. Don't worry, you will definitely be made to feel very welcome! And, you will be seeing the Turkey of the Turks. No cruise ship mobs here. Below you see other Sufi saints' tombs within the shrine. Notice the green covers and turbans on the tombs. 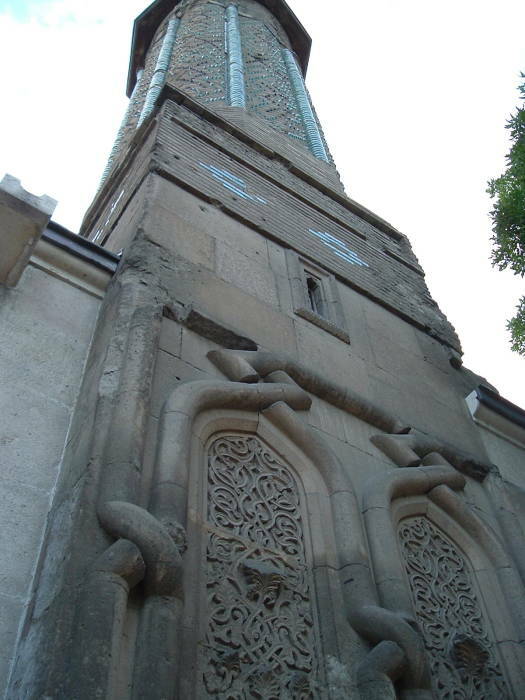 This is the Ince Minare Medresesi, or the Seminary of the Slender Minaret. It was built in 1258-1279 under the Seljuk Sultanate vizier Sáhib Ata Fahreddin Ali. Notice the elaborate carving on the gateway, and the tile work on the minaret. It's now a museum with stone and wooden artifacts from the Seljuk and Ottoman periods. This is on the traffic circle around Alaettin Tepesi. The trend of naming most everything after Ala'adin started during the Seljuk Sultanate of 1150-1300. 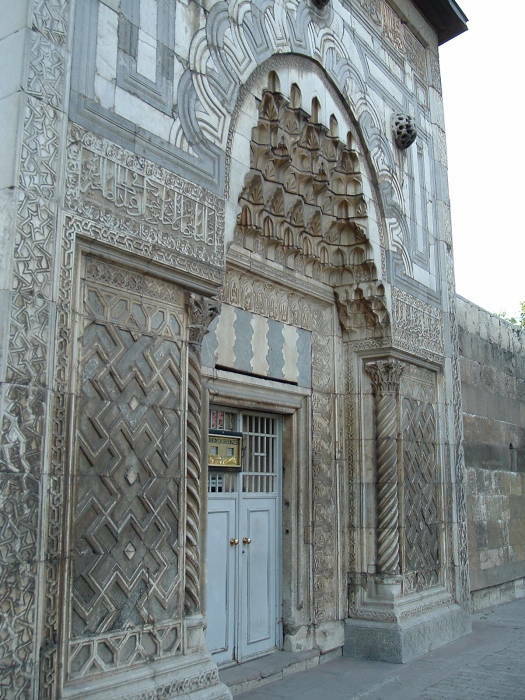 The gateway at Ince Minare Medresesi. is covered in finely detailed carving. 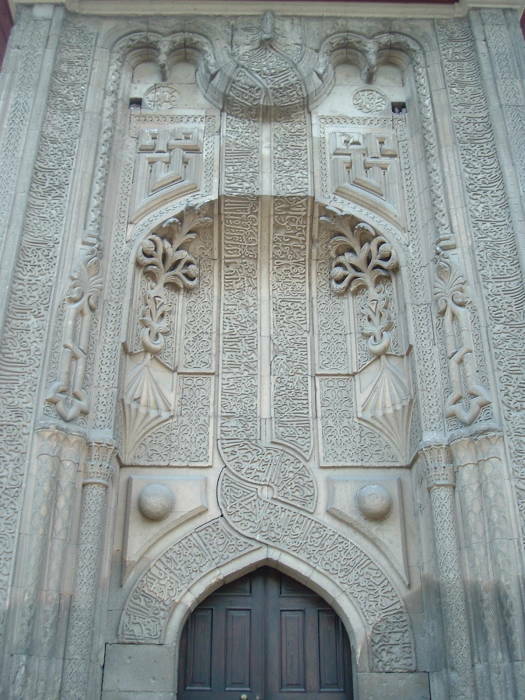 This is the gateway at Büyük Karatay Medressi, or the Great Karatay Seminary. 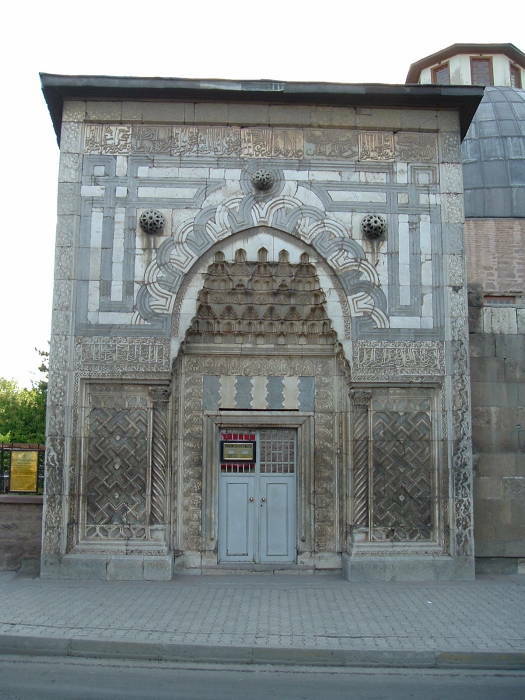 It was built in 1251 by an Emir seriving the Seljuk Sultan, and it was an important Seljuk-era theological school. Now it houses a very nice tile museum. 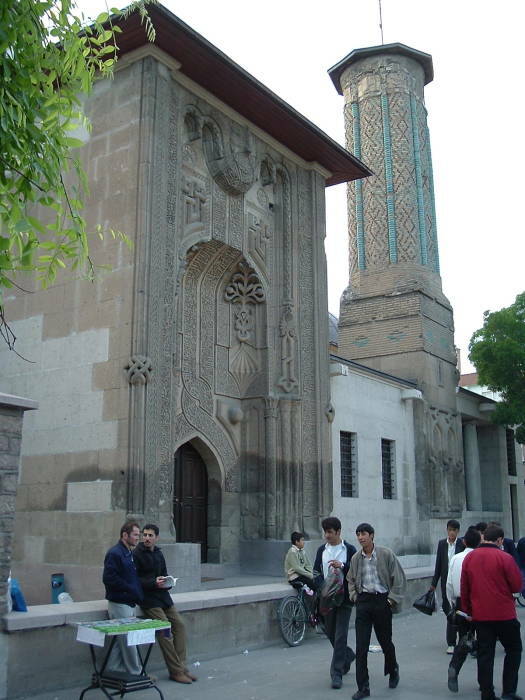 The hemispherical dome is visible beyond the gateway at Büyük Karatay Medressi, or the Great Karatay Seminary. Part of the tile museum occupies that dome. In early evening we're in a rooftop restaurant just across from the shrine's gardens. We're looking at the Mevlâna Shrine in the glow after sunset. 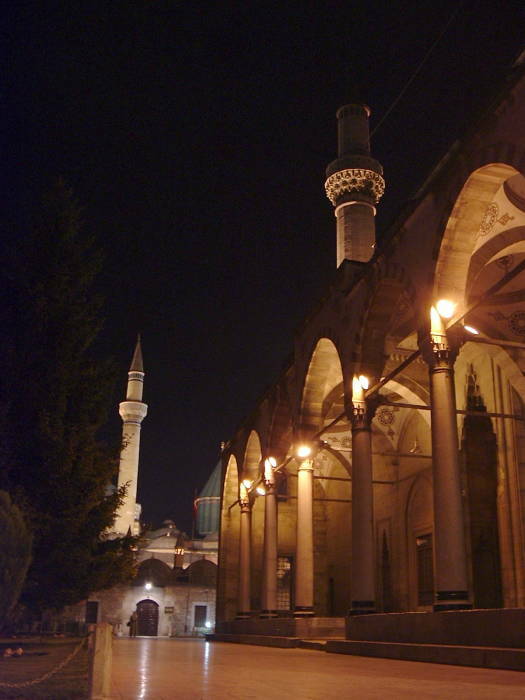 Later that same evening we take in the night-time view across the front of Azizye Camii (Mosque) toward the Mevlâna Shrine.